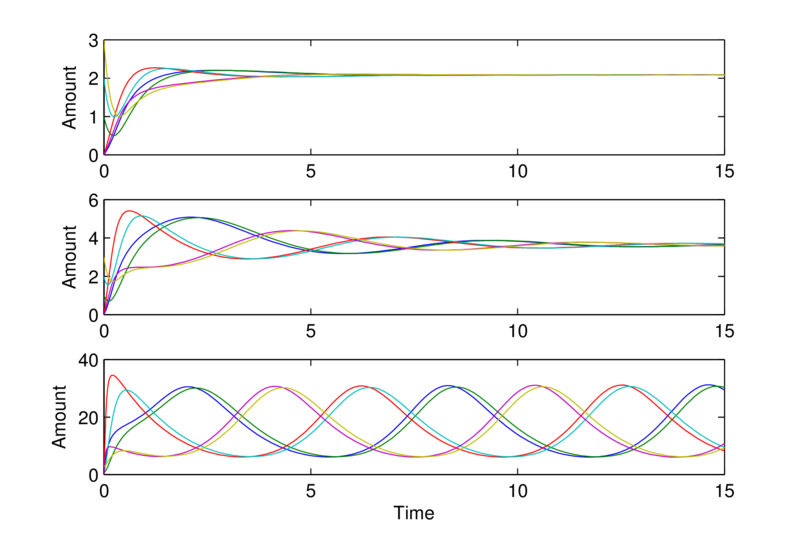 introduce you to the concept of systems of differential equations and how they can be solved numerically in MATLAB. 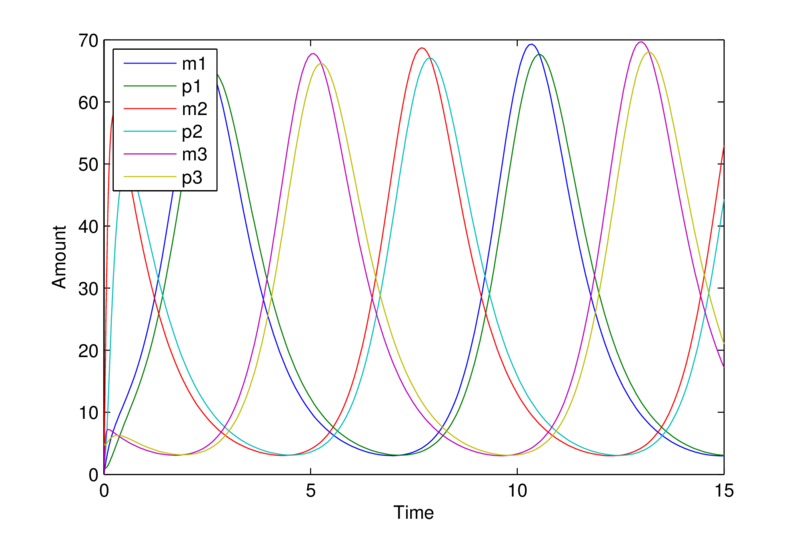 demonstrate how oscillations can arise in non linear dynamical systems through limit cycles. Emergence is a key property of systems. of a limit cycle, a purely non-linear phenomena and extremely important in the modelling of biological processes. This lesson covers all areas of sections 2.3.2-2.3.5. In addition it also introduces oscillations, the maths of which is covered in section 2.4.
which is shown diagramatically in Figure 1.9.1. The reporter plasmid contained the reporter gene coding for GFP under transcriptional control of the TetR protein causing TetR to repress the production of GFP. 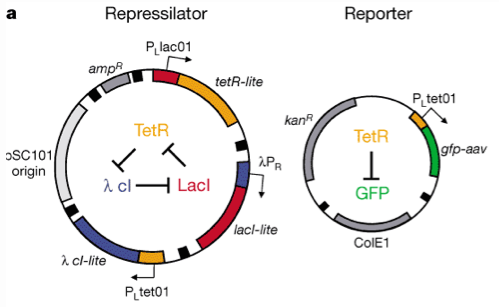 Hence the levels of TetR control the levels of GFP in bacteria carrying the two plasmids. , ensure that only bacteria carrying both plasmids are present in the experiment. is the Hill coefficient due to the cooperativity of the repression.
. Later on you will see how to make the function accept the parameter values as well. and the results are shown in Figure 1.9.2. Matrices will be covered in the next submodule. here means "select all" so we are effectively selecting a column. How does this effect the steady state solution? amounts tightens and unravels, respectively.
. The plots are shown in Figure 1.9.3.
and is the signature of sustained oscillations. 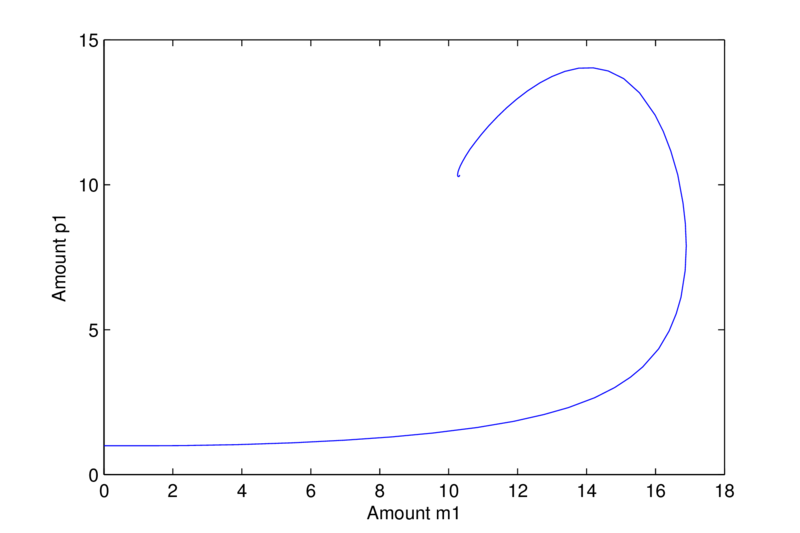 This example also demonstrates the concept of "basins of attraction"; depending on where we start the system we may end up with very different behaviour. and keeping the rest of the parameters fixed. you will see that the third argument must be a structure and we do not want to use this so we pass an empty array. 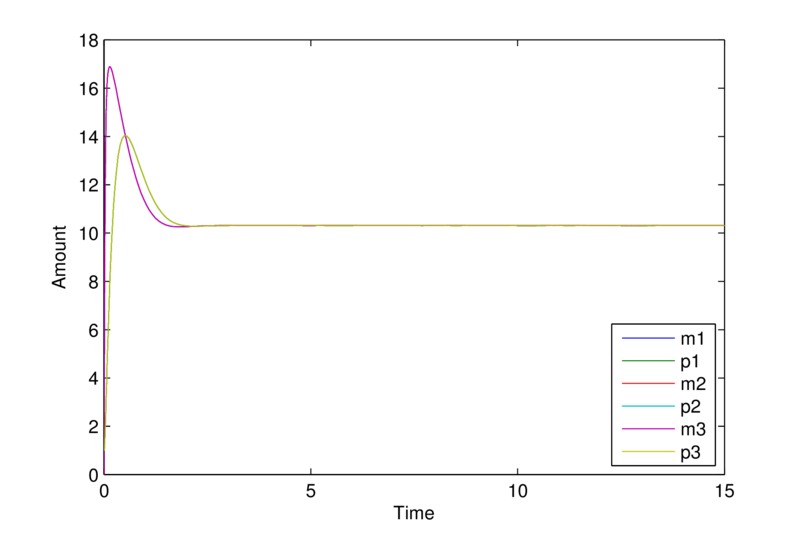 The resulant plots are shown in Figures 1.9.4 and 1.9.5. A modification of the repressilator is to use a cyclic network of four genes, where each gene codes the repressing transcription factor for the next gene in the cycle. 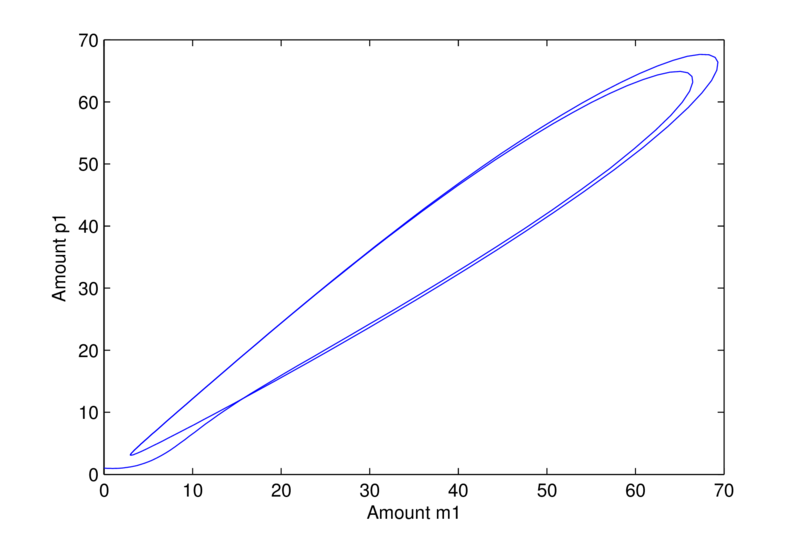 steady states and/or show oscillations). Plot the graphs of the solutions you found. Try a few different sets of parameters. Do any of them produce limit cycle (sustained) oscillations? Optional extension work: Consider the differences between the three and four gene networks. Can you reason why they have different behaviours? What would happen with a five gene network? Has anyone done this experimentally?